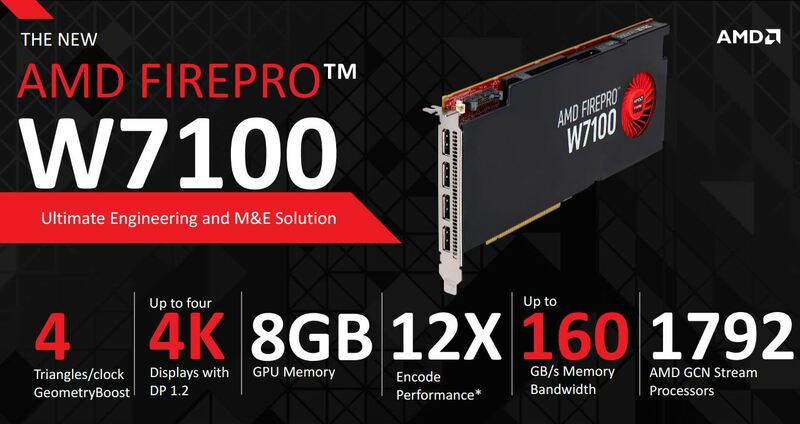 AMD, today launches their new FirePro professional graphics lineup which includes the new FirePro W7100, FirePro W5100, FirePro W4100 and FirePro W2100 graphics cards. 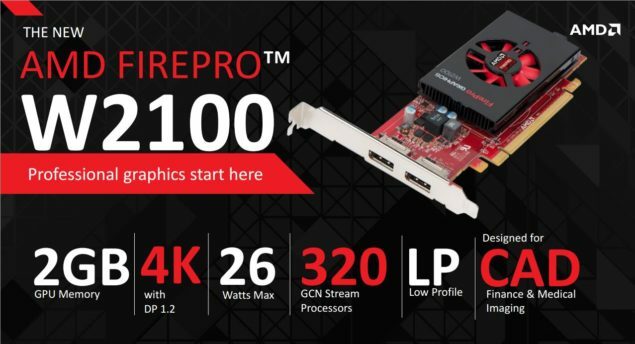 The latest FirePro W7100 graphics card features the latest Tonga GPU core architecture which runs at a sub-150W TDP and features 1792 stream processors which identifies that this is a Tonga Pro variant. 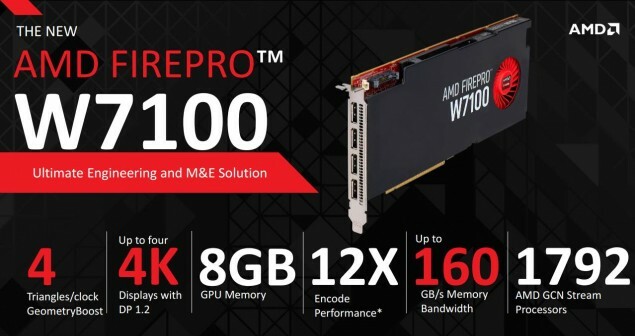 While AMD has already launched their flagship offerings in the FirePro lineup which include the $2500 US Firepro W8100 based on Hawaii GL-Pro and $4000 US FirePro W9100 based on the full Hawaii GL-XT variant. 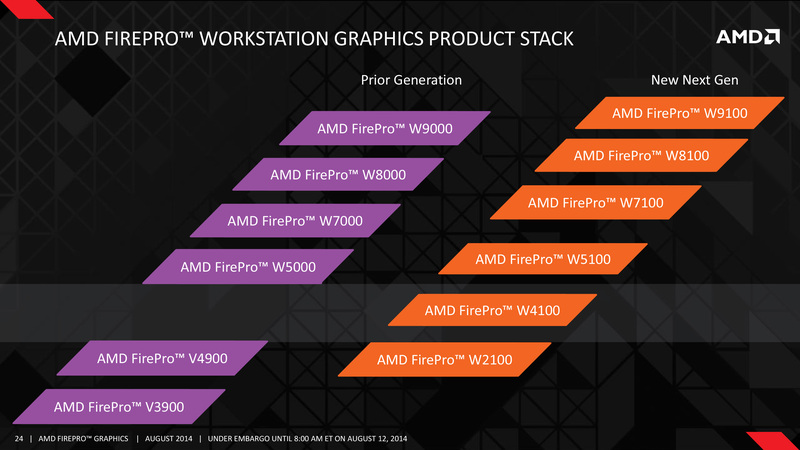 The latest of the FirePro lineup is based on new and rebranded cores which include Tonga, Bonaire, Cape Verde and Oland. It should be noted that the Tonga GPU is a completely new chip which features 4 triangles/clock geometery boost and is a replacement for the current Tahiti based chips. 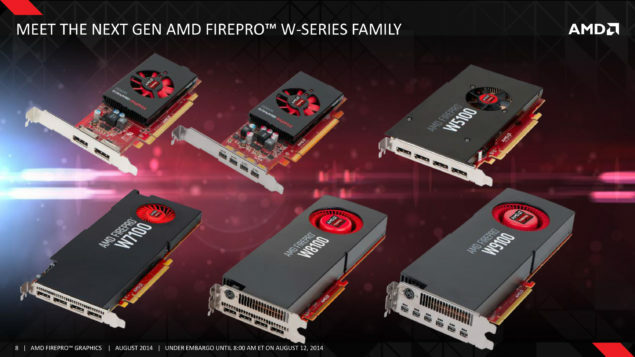 The consumer variant of the Tonga GPU codenamed the Radeon R9 285 and Radeon R9 285X will arrive in August and Q4 2014 respectively. 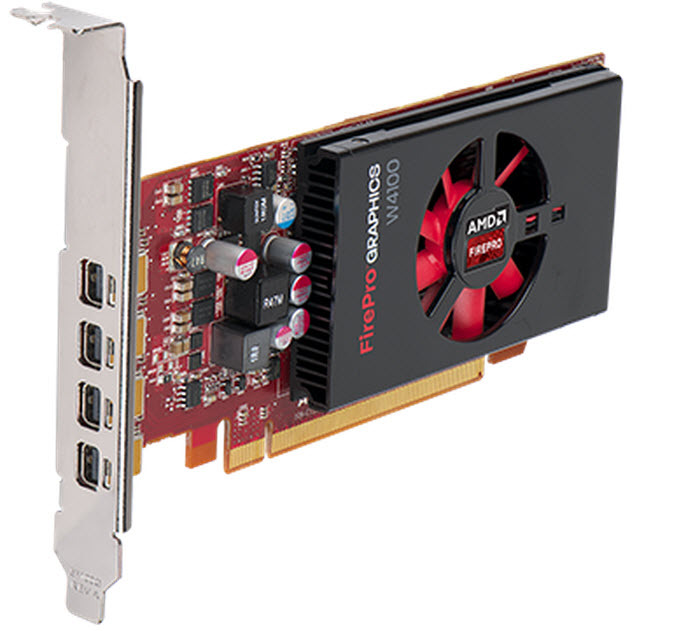 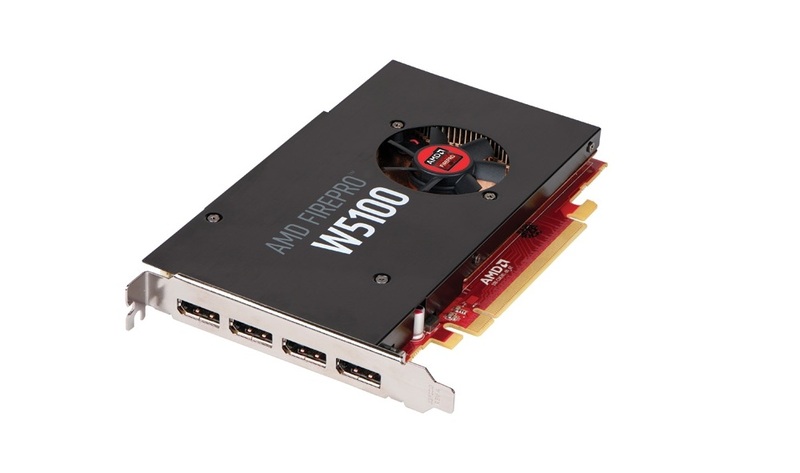 The AMD FirePro W7100 Tonga GPU based graphics card features 1792 stream processors configured in 28 compute units. Based on the GCN 1.1 die, the Tonga GPU has 32 Compute Units in total but we are looking at a toned down version which has four CUs disabled resulting in the 1792 SPs variant. 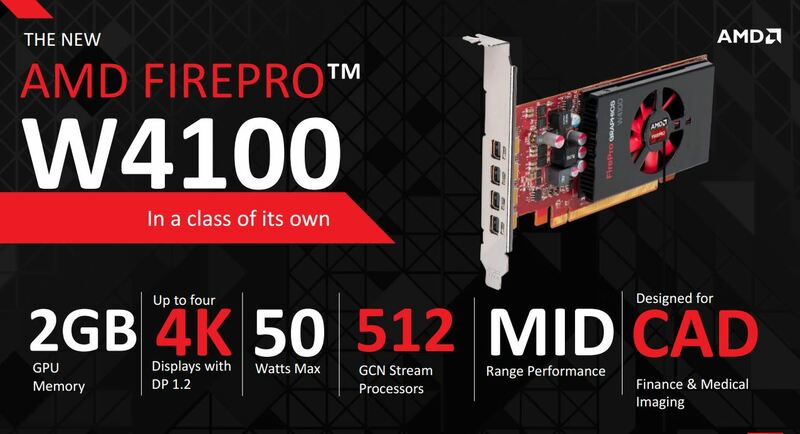 The FirePro W7100 like I said has 4 triangles per clock cycle, 32 ROPs, 112 TMUs, L2 cache of 512/1024 KB and a 256-bit memory controller. 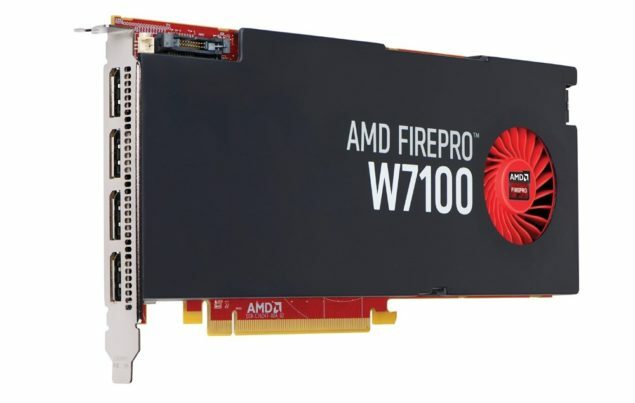 The W7100 features a 8 GB GDDR5 memory running across a 256-bit bus pumping out a cumulative bandwidth of 160 GB/s and has 12 times the encode performance of W7000 while display outputs include the ability to drive four 4K monitors with Display Port 1.2. 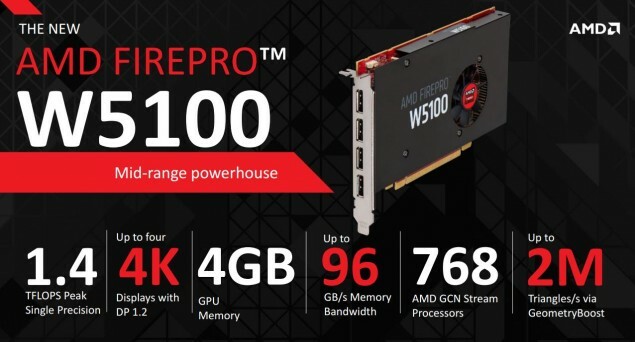 The Tonga GPU was always meant to be highly efficient and AMD has toned down its TDP to sub-150W so we can say a TDP of 150W is what’s to expect from the consumer Radeon R9 285 variant which goes on sale this month. 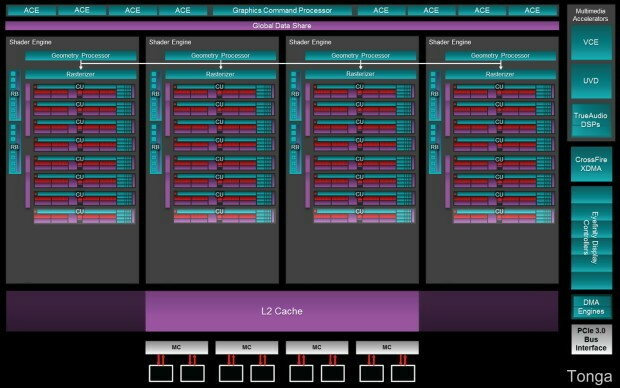 From the block diagram comparison posted by Hardware.Fr, we can see that the Tonga GPU houses eight ACE (Asynchronous Compute Units) compared to just two on Tahiti and each shader engine has its own geometry processor and a rasterizer unit which houses 8 Compute Units per block. The Tonga Pro variant has two of these CUs disabled resulting in 1792 stream processors. The Multimedia accelerators block has been updated with the XDMA CrossFire engine and addition of TrueAudio DSPs which deliver the TrueAudio tech. 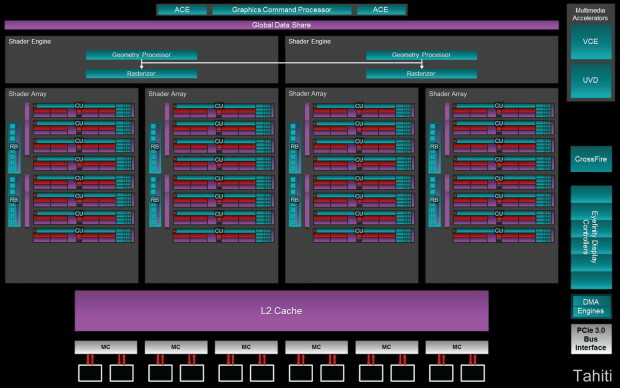 Last we can see a large L2 cache, part of which is blacked out which points that this model doesn’t feature the full core but it does have a larger cache compared to Tahiti which may tell why the card is less resilient to bandwidth. The rest of the lineup include the FirePro W5100 which is a Bonaire XT variant with 12 CUs and 768 stream processors with a sub-75W TDP followed by a FirePro W4100 “Cape Verde Pro” model with 8 CUs and 512 stream processors and lastly, the entry level FirePro W2100 “Oland Pro” with 5 CUs and 320 stream processors. 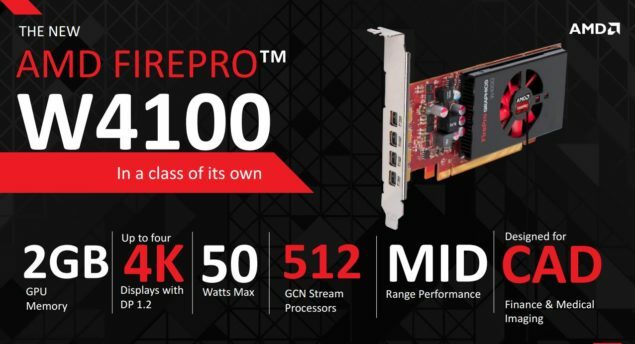 What’s more or less confirmed is that the Tonga GPU will have a XT variant with 32 full CUs matching the Radeon R9 280X Tahiti XT in terms of core specifications but we are keen to see how bandwidth will effect its performance since the card does use a cut down bus interface of 256-bit with just 160 GB/s bandwidth compared to 288.0 GB/s bandwidth on the 6 GB Tahiti models. Press Release – AMD today at SIGGRAPH 2014 unveiled new additions to the next generation AMD FirePro professional graphics family — all designed to provide exceptional application performance for the entry-level workstation user up to the ultra power user, backed by larger memory configurations, top to bottom 4K display support, increased compute performance, application certifications and rock-solid drivers.